It’s a dark and rainy day here, so I decided to do something completely out of character – bake cookies! I should probably be doing housework, but since I dislike it intensely and can only do it in spurts, I figured making a recipe with passive chilling time would be okay. 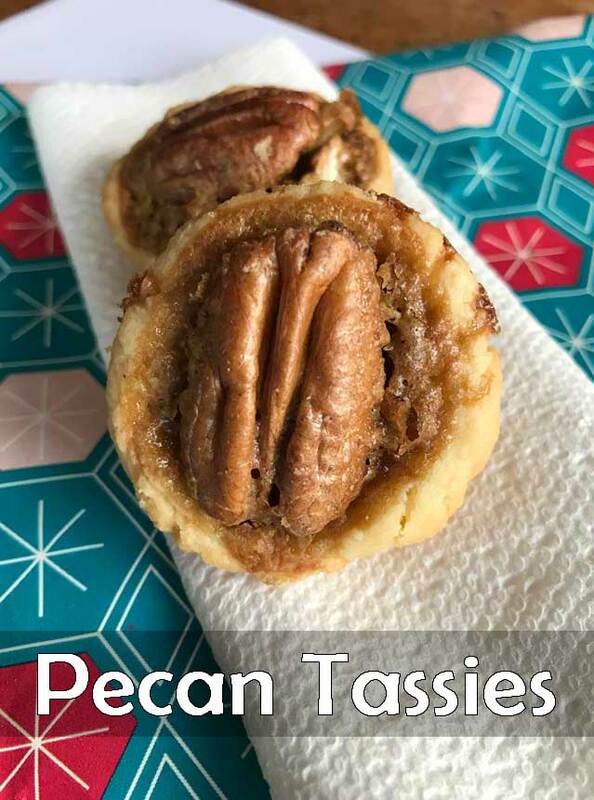 Pecan Tassies fit the bill. Tassies are an old Southern dessert whose name comes from the French word “tassette” which is a small pocket or pouch. The pastry shell or “pouch” is usually made of only three ingredients – cream cheese, butter and flour. The filling is typically lemon or pecans. Pecans are native to the south and tassies are indeed, an old Southern dessert. This recipe is easy. The dough took less than 5 minutes to make. While it chilled, I cleaned my daughter’s room and washed linens. By then it, it was time to mold the little dough balls into the cups, which was a little boring. Then again, some might find that part relaxing and fun. I used a combination of recipes. The dough is from Southern Living and the filling is one I put together after looking at a few others. 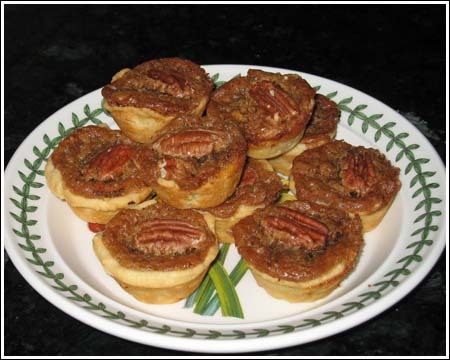 Pecan Tassies are miniature pecan pies baked in a mini muffin pan. Spray a 24 indentation muffin tin with cooking spray. Prepare crust first. Beat butter and cream cheese at medium speed with an electric mixer until creamy. Add flour to butter mixture and stir until incorporated. Shape mixture into 24 neat balls; cover and chill 1 hour. (I set the balls in mini muffin tin and put the pan in the refrigerator). Press balls into discs and fit them neatly into the 24 indentation mini muffin tin; dough should come all the way up the sides. Filling: Toast the pecans using your favorite method (350 for 8 -10 minutes). Let them cool and then chop. Sprinkle chopped pecans in the pastry lined cups, dividing evenly among them. Stir together egg, brown sugar, butter, vanilla and salt. Spoon filling over pecans. Top each with a pecan half. Bake at 325 degrees F. for 25 minutes. Remove from oven. While tassies are warm, slide a knife around edge and lift tassies from pan. I made these yesterday and they are super nummy. My 10 year old daughter helped molding the dough into the muffin tin which helped a lot! We are big pecan pie fans here, I don’t know what took me so long to make this recipe. Jackie, I don’t have those. Interesting. Thanks so much for that Penzey’s recipe. Yum. These are similar to your tassies. They are so good. At Christmas I made them using orange extract and they were to die for. Is it a candy, or is it a cookie? You be the judge. Fudgy Cups can be made with many different flavorings – change them to your taste. Use all vanilla for a yummy chocolate filling, add orange for a zesty, rich filling, or almond for a smooth nutty flavor. If you like chocolate covered cherries, put half a maraschino cherry in the bottom of each cup before adding the filling. Sift together the flour and cocoa, set aside. In a small bowl, beat the butter, cream cheese, and sugar until fluffy. Add the flour mixture and beat until combined. The dough will be sticky, so refrigerate it for at least 30 minutes. Preheat the oven to 325°and lightly spray two mini-muffin pans with vegetable oil spray. 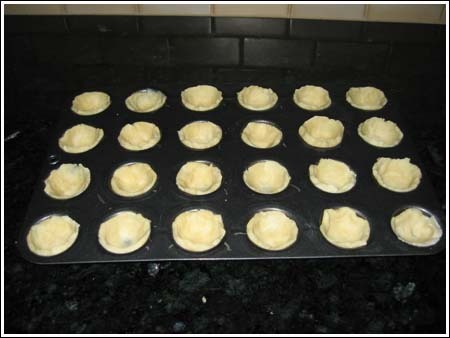 Divide the dough into 24 balls and press each into the bottom and up the sides, about 2/3 of the way up) of the muffin tin. Mix together the melted butter, cocoa, egg, vanilla, and additional flavoring of choice. Mix until well blended. If using cherries, place one half of a cherry, cut side up, in each muffin cup. Spoon about 1 tsp. of filling in each cup. Bake for 18 minutes, or until the filling is set. Cool for 10 minutes in the pans. Remove from pans and cool completely on a wire rack. Anna, Do you have one of these http://www.kitchenkrafts.com/product.asp?pn=BE3254&bhcd2=1175287194 or something similar (I have a wooden one from Pampered Chef but I have a feeling they might have been discontinued). They speed up the process of molding the dough to the pan. Elaine, I have to admit I hadn’t bought Fritos in ages (I prefer Doritos). I bought them specifically for the candy. My daughter, who did not like the candy one bit, now begs me to buy plain Fritos. Tracy, that Hormel contest is pretty wild. The interface on their web site is cool. Thanks for more great tips, Anna. Btw, I did get it together enough last night to put together something to submit to Hormel Chili contest. Um, yum. You can bring these to bunco next time. I keep meaning to try the frito candy, but my kids eat the fritos before I can make the candy! Brett, thanks for the link. I am completely in awe of people who put new life into old houses. What a beautiful thing. In sort of a different note, I had my kitchen remodeled after I won the Bake-Off. I was happy and looking forward to the new kitchen, but in my mind cooking in any sort of space was all I needed. Now that I have the new kitchen and am enjoying how much more functional it is (deep sink, easy-to-clean-floors, non-hellish lighting) I am baking and cooking WAY more than before. Thanks so much for all of the information–truely appreciate it! What got me started on the idea of entering the Pillsbury Bakeoff Contest in the first place is that I love to cook and I recently won a kitchen makeover. Since I have this new kitchen with great gadgets, cooking is now a whole new experience. Again, thank you so much for you time and advise! They generally alternate between savory and sweet. Since savory won (as you know won lat year) sweet is my bet for this year. Also, Pillsbury likes things that are not what they are supposed to be. For instance, a savory ingredient used in a sweet recipe or visa versa. I followed your last advise and developed a recipe that used chicken, chocolate and eligible ingredients. Pillsbury also likes simple. I used prepared chicken in a few of my recipes. Sure cuts down on prep time. If you can, pick up a copy of the book “Best of the Bakeoff” and get acquainted with the types of recipes that have won over the years. Obviously, a lot of the ones from the fifties and sixties use more ingredients, but look carefully at the recipes from the nineties and more recent bake-offs. Look for patterns. Also, take some time to look through recipes in the Pillsbury recipe finder. Pillsbury generally likes readily available ingredients, but there are certain ingredients that are kind of “on the verge”. For instance, back at Bake-Off 41, I used garam masala. It was considered exotic a few years ago, but definitely more widely used today. A lady in the past Bake-off used smoked paprika….the kind from Spain. It wasn’t in my grocery store, but my grocery store carries it now. It was a cutting edge ingredient and she used it in a very familiar way — a chicken wrap/burrito type thing. Tip for the superstitious. Since 1996 it’s been Chocolate-Chicken-Chocolate-Chicken….it’s a Chocolate year. A dessert might win, they win quite often, but if you shoot for dessert, be ready for some stiff competition. I’m thinking a chocolate savory dish. Then again, maybe this is the year the cycle will be broken. Enter as many times as possible and as many recipes as you can. Also, if you don’t get a call, you’ll still have X many new and original recipe ideas which you can retool and use for other purposes….or retool and use for the next bake-off. Proof your recipe well and then have a friend look it over. I am the worst proofer, so I usually have to proof my recipe 5 or 6 times and I still find mistakes. Lots of dishes are made with 20 ingredients and take all day, but most people today like convenience. Also, make sure it’s something that looks nice, because appearance is important. Take a family recipe or ethnic recipe and put a new spin on it. People’s tastes are more discriminating these days and there are so many ethnic recipes which are destined to become more popular across the board. I think Greek foods are supposed to be in vogue right now, so maybe take a Hellenic approach. Rachael Ray just made up some sort of Greek Spanakopita Pizza. I saw it on her show and thought what a great bake-off entry that would be. Too bad Rachael’s ineligible. Ha Ha….’cause you know she could use the cash. Here’s that pizza recipe. One thing I found was coming up with recipes became an obsession. I’d walk through stores, see products and think “what could I do with that? How could I combine that with pie dough/crescent dough/ pizza dough etc.” Just have fun with it. It’s kind of like sudoko but with food. If you can’t think of anything, give yourself a break and you might be surprised that the perfect idea just pops into your head when you are not expecting it. But you still have to do some work at first. Also, don’t give up. Like I mentioned earlier, if you make something everyone loves and you don’t get a call from Pillsbury, you can use your idea elsewhere. There are a lot of fun contests out there. Pillsbury just happens to be the biggest and probably the oldest one. Last tip. Use a search engine to check and make sure your recipe idea hasn’t been done somewhere else. Looks like another great recipe to try! Thanks!